Air Canada flies to the islands twice a day during the summer months. Air Canada is a member of Star Alliance with United Airlines. This makes it very easy for travel. You can book your flight with Air Canada or United, and be checked right through to Sandspit on the Queen Charlotte Islands,BC. Alternatively, we have a travel agent that would be happy to help book your travel for you. Your travel will take you through Vancouver BC, where you will clear customs. Be sure to bring your passport! 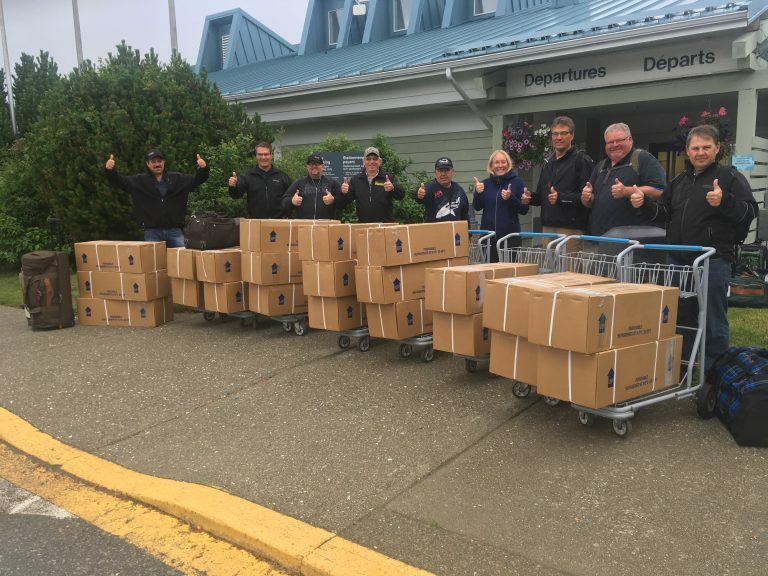 From Vancouver, you will have 1 more flight with Air Canada to the community of Sandspit , a small town of less than 300 residents on the Queen Charlotte Islands / Haida Gwaii. We will greet you at the Airport and take you on a short drive to the Lodge. For your return flight, we will have your catch packaged into Fish Boxes that conform to airline specifications. You will be able to check these boxes as luggage right through to your final destination. Keep in mind that we supply foul weather gear for your convenience so you can fly with less luggage, but you are welcome to bring your own rain gear if you prefer. Currently the airlines allow 2 free carry on pieces so it is possible to fly up without checking any luggage. This will let you check-in your Fish Boxes as luggage on your return flight. We suggest that our Guests wanting to take advantage of this carry on option use small soft sided gym bags as they fit well into the overhead compartments. Please feel free to Contact us if you have any questions regarding travel. The Travel Agent is Elan Travel. Their number is 1-877-897-5071. Just let them know that you will be Fishing with Cartwright Sound Charters.